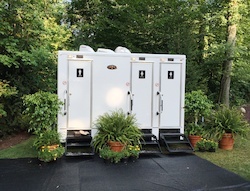 If you are planning a wedding, or are involved in outdoor event planning, Superior has the best selection of portable toilets and restroom trailers for wedding events or receptions. Professional wedding planners and do-it-yourselfers alike understand that it goes beyond just considering the basic needs of guests or getting a nice porta potty rental; working with the right company on this final detail is an important part of creating a successful special day. Superior has a wide selection of portable restrooms and restroom trailers, suitable for all types of weddings. If you are planning a casual wedding, we offer a variety of portable restrooms with hand sanitizer. For more formal affairs, we offer fully-equipped luxury restroom trailers, which include flushing toilets, hot and cold water, wood grain floors, heating and cooling systems, stereo systems and more. The interior and exterior of your trailers can even be decorated to match the rest of your wedding décor. 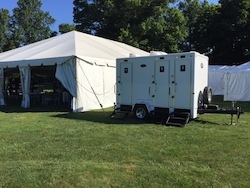 Most weddings of 350 guests or less accommodate guests with a two or three stall unit, while a ten-stall unit can easily service large weddings or events of up to 800 guests. 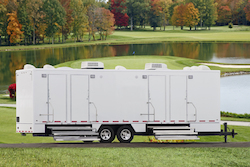 Our restroom trailers provide comfortable and upscale sanitation solutions for indoor and outdoor weddings. To request a quote, or to learn more about portable toilets and luxury restroom trailers in Ohio, West Virginia, Kentucky, Michigan and Indiana, simply click the quote button to your right or chat live with one of our service professionals during regular business hours. The Elegance Series 10 station restroom trailer brings the feel of an upscale, in-home bathroom to your outdoor event. The Stan Hywet Hall and Gardens in Akron is a beautiful, 70-acre National Historic Landmark that features sweeping gardens and land, plus the nation’s 6th largest historic home and other historical buildings.